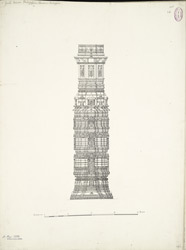 Illustration of the north minaret from the Queen's mosque in Mirzapur, near Ahmadabad. The Queen's mosque, also known as Rani Rupavati's Masjid, is located near the Delhi gate in Ahmadabad. ?It is said to take its name from two ladies of the royal household who were buried in the adjoining Rauza (tomb), but in whose reign they lived or what the exact date of this masjid is not on record?. The greatest form of beauty of this mosque is to be found in its details, especially in that beautiful form of tracery which fills the niches of the minarets. ?